Residential – Schea Van Lines offers residential moving services for homes of any size, from an apartment to an estate. Our company will help ease the transition into your new home in an efficient and affordable move. Full Service – Schea Van Lines offers full service moves as well. We will send specialists to your home to properly pack your goods with a full line of boxes and packaging material available. Commercial – Schea Van Lines specializes in commercial projects as well, relocating your business from point A to point B. After Hours Service – If your project is restrained to being done between sunset and sunrise, Schea Van Lines is still able to relocate you properly and efficiently. Our trucks are equipped with state of the art floodlights that illuminate the loading platform and the area around it. Our professional movers are able to operate in nearly any conditions. Emergency – Unusual circumstances will arise at times, giving you and your family short notice about the need to move. Our phone is on 24 hours a day to provide you with emergency service. We have the ability to have a properly prepared crew at your doorstep within hours. Labor Only – Schea Van Lines also offers “Labor Only” moves for customers who do not need a truck or have rented their own. 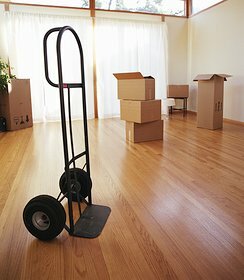 Movers can load or unload portable storage units, as well as relocating items that are already in your home.